Joan Sutherland, arias de Verdi, Rossini, Mozart, Bellini, etc. Magistral interpretación de Joan Sutherland. 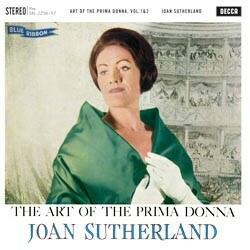 Bajo el título The Art Of The Primadonna - Joan Sutherland canta arias de óperas de Thomas Arne, Vincenzo Bellini, Leo Delibes, Charles Gounod, Georg Friedrich Händel, Giacomo Meyerbeer, Wolfgang Amadeus Mozart, Gioachino Rossini, Giuseppe Verdi. Dedicado a los amantes de esta excelente cantante y también para aquellos que quieran introducirse en el fascinante mundo de la ópera a través de esta excelente selección de arias. The 'art of the prima donna' stands out like a shining star in the firmament of virtuoso song repertoire and the world of grand opera. And this double LP pays homage to this cult. It is of little importance that the majority of the divas who are praised in the cover text celebrated their success long before the days of the phonograph and that therefore no recordings of them exist. After all, Joan Sutherland with her wonderfully supple and artistically flexible soprano voice is more than compensation, and she gives us an idea of how these works would have sounded in the salons of the 18th and 19th century. Joan Sutherland is wonderfully British in her poised rendering of the opening work, Thomas Arne’s coloratura aria The Soldier Tir’d, and in Handel’s jubilatory Let The Bright Seraphim. But she earned her honorary title 'La Stupenda' by singing Italian repertoire. With utmost ease, agility and remarkable clarity in the top register, her voice gets right to the heart of bel canto. One of the most exquisite and beautiful roles is demonstrated in the demanding aria Casta Diva from Bellini’s Norma, here sung in the original key. How lucky we are not to have to imagine how this great singer might have sounded, but can listen to her amazing voice over and over again.